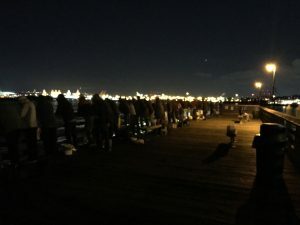 Jigging for squid in Puget Sound is often deemed a nocturnal fishing affair as the best action usually occurs in the middle of the night when the majority of people are sound asleep. 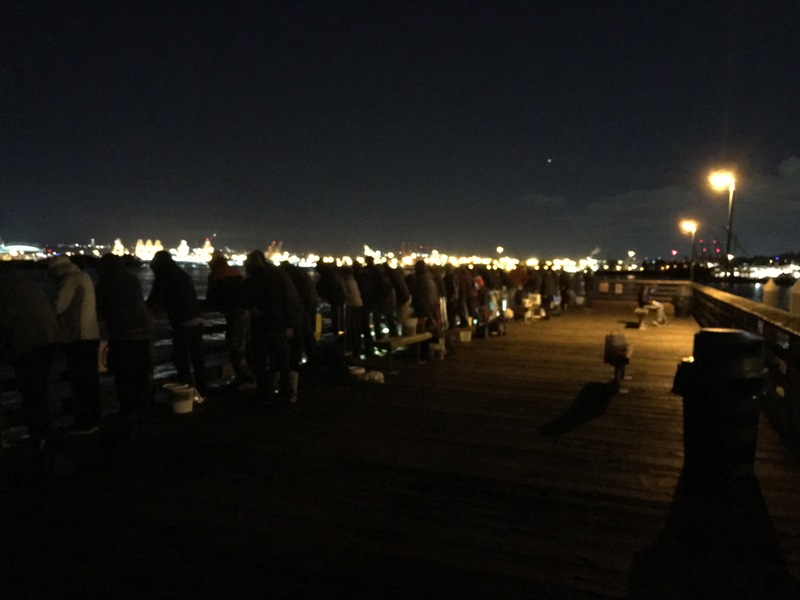 Those willing to take on this late-night fishery will reap the rewards by having piles of tasty deep- or pan-fried calamari for the dinner table, and the sheer fun and camaraderie of hooking up with oodles of these slimy creatures. Don’t expect solitude when pursuing them as hundreds of others with fishing poles, colorful jigs and a high-powered portable lamp to light up the water below have been crowding piers along the Seattle waterfront, and from Edmonds south to Tacoma and across the sound at Bremerton since right after Labor Day when word got out the fishing had started to ramp up. From late summer through the heart of winter-time, millions of squid return to Puget Sound, and gorge on small baitfish and crustaceans as they prepare to spawn. While the best squid jigging usually occurs from late November to February it isn’t uncommon to catch them right now when the weather is much more tolerable, and packing along all the heavy clothing isn’t necessary. Chamberlain says he’s been selling plenty of jigs to customers in recent weeks as word has leaked out that jigging for squid is off the a decent early start, and should stay this way well into the winter. Sorry, but you won’t find any of the mythical ship-wrecking types of “kraken” squid in our area nor the more popular giant Humboldt squid that travel the western coastal waters, and are known grow to 8 feet in length and weigh in excess of 100 pounds. Squid in our neck-of-the-woods – to be more precise in Puget Sound marine waterways – are called Pacific squid or “market squid” and their average size is 5 to 12 inches. Squid swim freely in huge schools, and have a very short lifespan of about 12 to 18 months. For reasons not known, squid feed mainly at night and are attracted to light, but tend to hide in the shadows of darkness only darting out into the light to pursue their prey. Since they tend to hang around the shorelines off public piers, catching them is pretty accessible and one doesn’t need expensive fishing gear. Just about any fishing rod will work, but many prefer lighter more sensitive long-length type rod with a trout-like spinning reel. Use light weighted line of 5 to 6 pound test so you can feel the light tap or vibration of an attacking squid(s). A weighted luminous plastic jig comes in a wide range of colors ranging in red, chartreuse, pink, blue, green, orange or nor no-color at all. Jigs don’t have “hooks” are each comes with an upward slanting sharp prongs. Some use an unweighted lure attached to a one-ounce lead weight allowing them to be dropped down to the desired depth. Many anglers will also attach multiple jigs to the main-line, but regulations say no more than four lures may be used at one time. Squid won’t actually bite the jig, but will wrap themselves onto the jig’s pin-like ends so keep steady upward pressure will keep them hanging on, and don’t give a squid any slack otherwise they’ll let go. Anglers will raise the rod tip up to about 10 o’clock and then slowly lower the jig back down to make it resemble an injured fish. Squid tend to school just below the water’s surface to about 20 to 25 feet down, but it’s good to work you lure from top to bottom in the water column to find them. Prime time to catch squid is during or right at high tide. While they often feed in darkness in the middle of the night, often times they’ll stay on the hunt into the early-morning hours just before daylight. The most popular places to catch them are along the Seattle waterfront at Piers 57, 62, 63, 69, 70 or the Seattle Aquarium Pier. 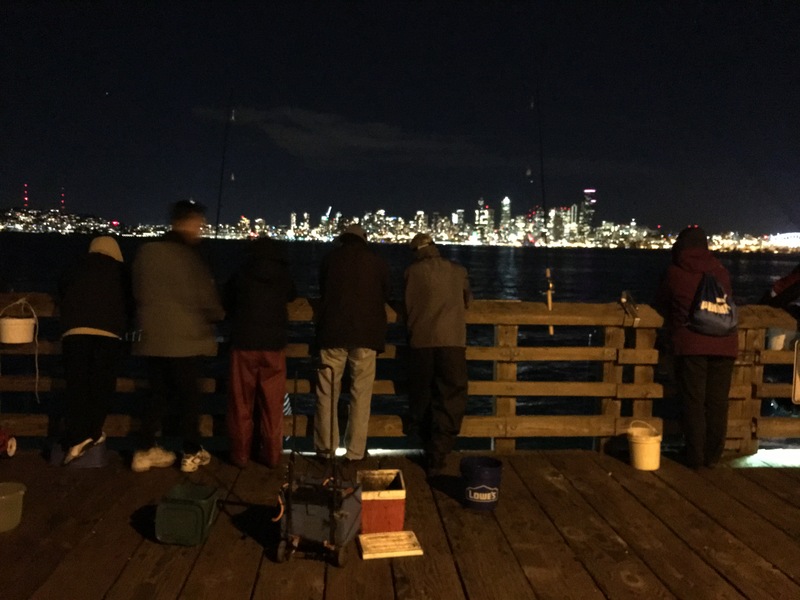 The best Seattle location in past squid seasons has been Pier 86, but was closed this past summer until further notice due safety concerns. 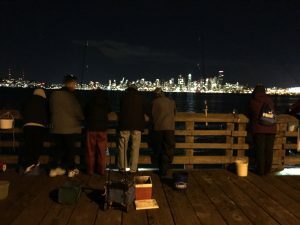 The Port of Seattle and state Fish and Wildlife are trying to determine the fate of the pier, since repairs to fix the cracked piers as well as failing electrical and water systems will be costly. Other ideal locations are the Seacrest Boathouse Pier in West Seattle; Edmonds Pier; Des Moines Pier; Redondo Pier; A-Dock and Shilshole Pier; Point Defiance Park Pier; Les Davis Pier in Tacoma; Fauntleroy Ferry Dock; Illahee State Park Pier; and the Waterman and Indianola piers in Kitsap County. A daily limit is 10 pounds or 5 quarts, and each angler must keep their catch in separate containers. A forage fish dip-net or hand dip net may be used; there is no minimum size limit for squid; and a state shellfish license is required for ages 15 to 69, and 70 and older will need a senior shellfish license. 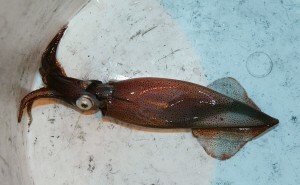 State Fish and Wildlife has information on squid jigging at http://wdfw.wa.gov/fishing/shellfish/squid/. The Big Wheel in downtown Seattle has been the best bet this winter. Stop into Outdoor Emporium in downtown Seattle and they can point you in the right direction!